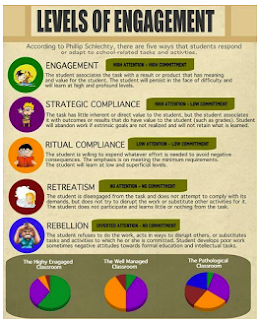 After posting about the "10 ways to get your students engaged" here is another good visual I learned about from Mindshift and which outlines different levels of engagement. As I have already argued elsewhere here in this blog, getting today's students deeply engaged (the first level of engagement below) in the learning experience taking place in class is not an easy task. Unless students see a direct relevance between what they are going to learn and how that information will help them them in their actual life , it becomes hard to hook and maintain their attention. Proponents of socio-cultural linguistics emphasize the importance of "context" in learning. Learning materials that are contextualized and tailored to speak to the immediate context of the learners are more likely to get students engaged and hence increase their rate of retention and comprehensibility. You can use this graphic to check the levels of engagement of your students. Have a look and share with us what you think of it. The original creator of this graphic is Dr. Roland Rios. Check out the visual from this page.